I use Blazer Brass all the time and I have never had a problem. Doesn’t seem any dirtier than any other ammo and every round I’ve fired has never misfired. I also cannot say enough good about Lucky Gunner. They deliver so freakin fast, by the time you click order it’s on your doorstep. I will not shop anywhere else! Little dirty but no issues yet. Would purchase again. Bought 1000 rounds on sale. Have cycled 300 rounds without a problem in my Glock 19. Cycled 70 rounds through my Shield 9mm without a problem. So far so good. Bought a brand new S&W SD9VE. Ran this, PMC Bronze, and Federal RPT. This was the dirtiest of them all. Sparks flying out and a 6" muzzle flash. Nothing a quick cleaning couldnt take care of. Also it is the most accurate out of the bunch. I bought a 1000 round case and shot 200 rounds through my cz p09 yesterday. I had a couple issues that I never encountered before. First is one bullet somehow dislodged from the case and ended up wedged in my barrel. The primer hadn't been struck and the powder dumped out of the case into the mechanism of my pistol. I've never seen this before, I'd post a picture if I could. Second issue is that some of the rounds seemed to have weak powder loads causing an improper cycling of the slide. The slide would not reset fully after these weaker rounds would fire. I also found that several of the copper jackets were damaged when they were pressed into the case. This left a protrusion of copper that had been scraped off the bullet which may have resulted in an improper seal. This may have been the cause of the failure to cycle properly. I've had the chance to shoot several hundred rounds of the Blazer Brass 115 grain and have never run into any issues. I'm primarily shooting it in a Sig P226 and Walther PPS. Never had a failure to fire or anything like that. 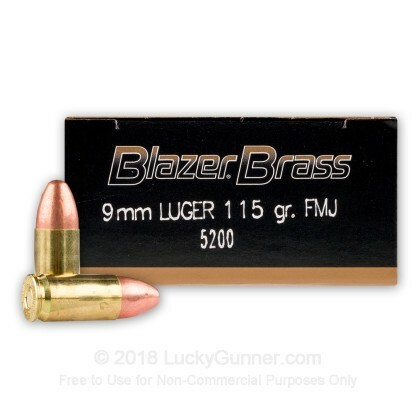 Still, Blazer Brass tends to be among the cheaper options in 9mm -- I'm not sure why. I initially hesitated to jump in because it was so cheap compared to the other ball (FMJ) ammo. I shot 100 accurate rounds through my cz75 with no failures. I have used Blazer for 2 years and have never had any issues whatsoever with any caliber or type of handgun. I also used a different shipping address and lucky gunner called me within 5 minutes of placing my order to make sure the address was correct. They have excellent customer service. All in all, I am well pleased with Lucky Gunner. Shipped in a timely manner. The staff is great and very knowledgeable. No problems with the Ammo. My 9 mm XDS and Walther PPQ M2 ate it up. No FTF-FTE. This company and product was worth the order. From what I remember, I received the product ordered very quickly and had no issues with the ammo. Picked up 100 rounds of this because it was cheap and available. Went to the range with this and 150 rounds of Remington UMC and couldn't tell the difference. Will start buying in bulk. ordered 2 50 count .380. Excellent service. Fast delivery. Not fire any yet, but know they will be trouble free. Getting ready to place oreder for 9mm for my Glock 19. Recommend to any and all gun owners. I have used the brand before and they performed just the same. Quality. Great doing business with you!! Great product, great price, and very fast shipping. Ammunition is hard to find these days but lucky gunner had all I wanted. Thanks and I will be doing business with you again!! Overall great "bang for your buck!" Purchased these rounds for target practice with my Ruger P95. Had no issues at all with this ammo and I had on my doorstep two days after I ordered. Great value with fast service! Really happy I found Lucky Gunner! Always product I need in stock. Never had a problem with any of their ammo. Super fast delivery. Now that's great customer service! I will be a long time customer. Excellent, for the price you can't be the quality...It's great to have options like Blazer Brass to keep you proficient with your shooting. I would recommend this ammo each and every time someone asks. Used this ammo in the past. No misfires, very few ftf, fte. I am always pleased with the ammo I purchase from lucky gunner!! Always have had terrific service from LuckyGunner. Living in SoCal you would think finding ammo would be easy - not the case. 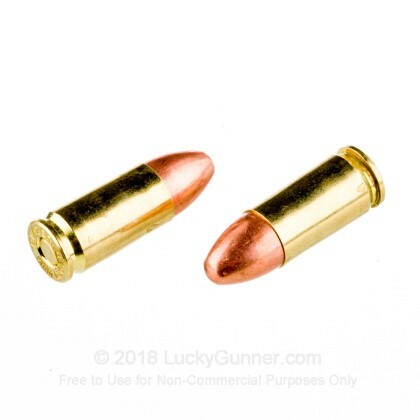 With LuckyGunner, order on a Monday, comes either Thursday or Friday (shipping via UPS ground) and to the range on the weekend. As for the ammo, the first 250 rounds for my new Beretta 92FS INOX performed flawlessly without leaving much residue (i.e. gun cleaning). Never an FTE. Good times! would highly recommend purchasing your ammo from Lucky Gunner.And ofcourse with a name like that how could you go wrong. I used this product in my Glock 19 and found it to be accurate, reliable and a really good value. Shipment was prompt. Will be doing more business with LG. You just have to love Lucky Gunners inventory system, never been told of a back order, just got what I ordered. 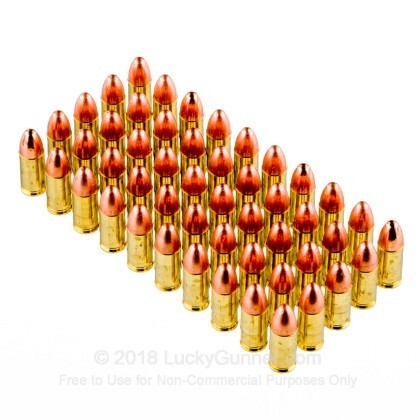 My latest order was for range ammo, worked just great, no mechanical issues, I have a system where I try to impart a failure but the ammo has never been the cause. In summation, great service, great prices and great ammo selection. Only one way to go and that's to Lucky Gunner!! I am impressed with your delivery system and support. Ammo good too. Ammo ordered performed wonderfully. Shipment was prompt and efficient. Price is competitive. Will be doing more business with LG. Great job by Lucky Gunner. Haven't shot the ammo yet. Bought these along with four other brands as a birthday gift package for my brother. He recently bought a new 9mm firearm, so I wanted him to try a few differeny brands. He hasn't had the opportunity to shoot any yet. I'm sure he will let me know, and I'll pass it on to ya'll when I can. It was my first tme dealing with Licky Gunner. I gave them 5 stars, and will deal with them again. Clean ammo! 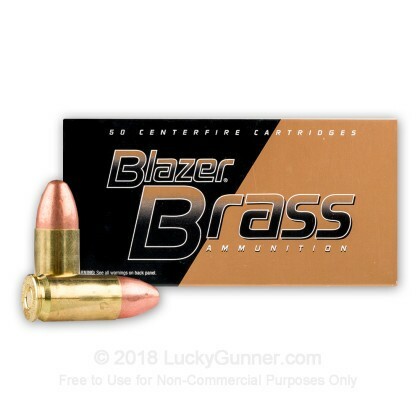 Blazer Brass is my choice target ammunition! This ammo is great for target practice. Not half as smokey and dirty as other ammo. My M&P 9mm shot 400 rounds if this ammo and never had a problem. The price is fair and Blazer makes reliable 9mm ammo from my experience. Lucky Gunner ships lightning fast so expect your order to come quick! Where I live it almost impossible to find ammo for my 9mm. Now I have bought 200 target rounds from you. Service was great, shipping was great, all around service was amazing. I will keep coming back as long as you keep 9mm in stock. Great product, no failures yet. So far I have fired 250 rounds only, and had no issues. Performed very well and priced right. I will definitely buy this ammo again from LG. Thanks for the speedy service, that's a real treat anymore. Used in my Glock 19 Gen 4. I had no misfires and not even a lot of residue when cleaning. I had my order two days ahead of schedule. used over half of purchased, works well in my glock 17. RAN 200 ROUNDS THRU MY TAURUS PT 24/7 PRO DS NO MISS FIRES AN NO STOVE PIPES, I REALLY ENJOY THIS AMMO AND HAVE COMPLETE CONFIDENCE IN THE MANUFACTURE. Just finishing 1000 rounds. No failure to fires and no stove pipes. I cannot say the same for the reloaded ammo I purchased from LuckyGunner. Just shot a hundred rounds last weekend and had two FTF and one stove pipe. Blazer will remain my preferred ammo, may be more costly than the reloads but worth it. Love this ammo groups well at 25yrds in my sd9ve. 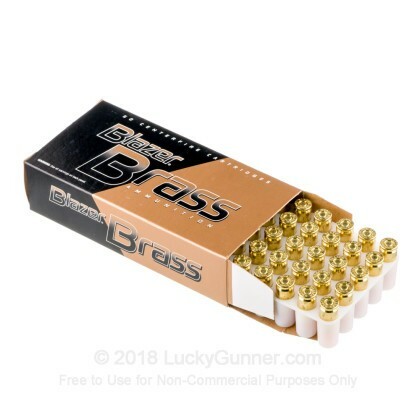 I've been using these Blazer Brass rounds in my Springfield XD and XDm 5.25 pistols for steel plate shooting and USPSA matches all year long, and have not had a single failure. This is affordable, high quality ammo. And it doesn't get easier than ordering from LuckyGunner - fast, reliable service delivered to my doorstep at a great price. Works great in my Browning Hi Power! Best 9mm ammo for the price and fast shipping. Got to love luckygunner. Product works great in my Glock 26. The price was good and the order shipped and was received very quickly. I will order again. Excellent service and product is top notch! Excellent, speedy service form Lucky Handgunner. My first 100 rds through my new Kahr PM9 have been flawless ... NO FTFs or FTEs. Just a great product. I just started using this product in my Ruger SR9 and am quite impressed. Accurate, reliable and a decent value. 350 rounds run through in two days and zero issues. I recommend this product. 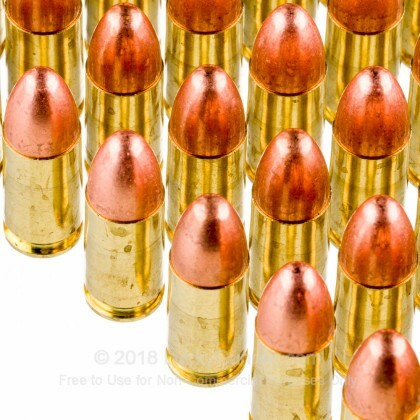 this ammo is highly credible and recommended,in my experience with these shells and having shot at least a thousand rounds through my sauer p250 I'v never had a jam,stove pipe,or missfire,and for around $13.00 thats not to bad for a good day out on the range. No FTF,Jams, or stove pipe. No problems feeding with my S&W MP9 c they all fire first time, every time..
Have shot hundreds of rounds of this ammo. No problems at all. Solid and reliable. We also have this 9mm - 115 Grain Full Metal Jacket - Blazer Brass – 1000 Rounds ammo in stock in a bigger quantity.